Jim Shore sets the stage in this Christmas pageant featuring the beloved characters from Peanuts. 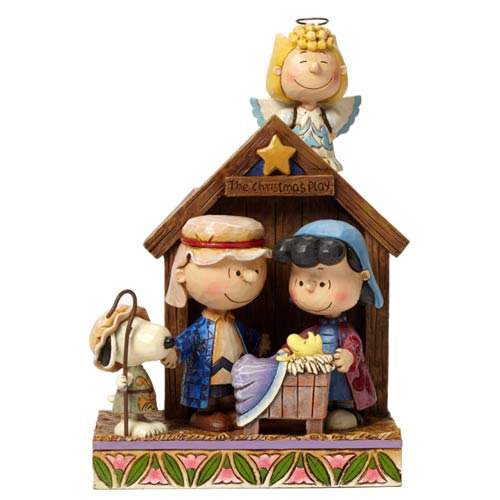 Starring Charlie Brown as Joseph, Lucy as Mary, Sally as the Angel, Snoopy as a shepherd, and Woodstock as the little baby, Jesus, this classic scene will bring the spirit of the holiday into your home. The Peanuts Traditions Christmas Pageant Statue is made of stone resin and measures approximately 7 3/4-inches tall 5 1/4-inches wide x 3-inches long. Pair it with the Peanuts Three Wise Men Traditions Statue to recreate the whole scene! (Sold separately). Ages 13 and up.